We’re all sad to see Open Door Policy go, but fortunately in its place is a worthy addition to Spa Esprit’s stable of great restaurants. 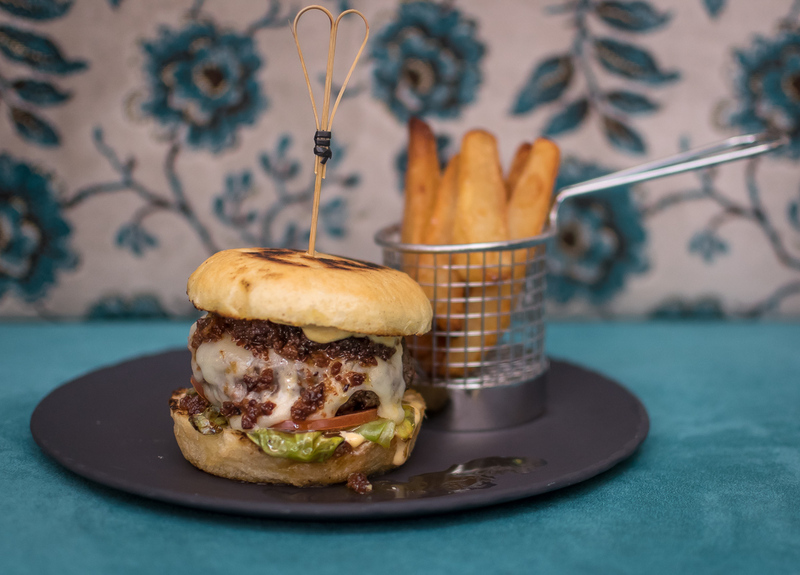 The Butcher’s Wife is helmed by consultant chef Diego Jacquet and head chef Diego Carlos Quispe and serves up a modern European menu that’s 100% gluten-free. The vibe is fun and casual and the plates designed for sharing, so bring your friends and dig into guilt-free, soothing dishes that’ll comfort your soul and delight your palate. We start off with a very good Baked Focaccia ($9) that’ll impress you with how fluffy and light in texture it is. 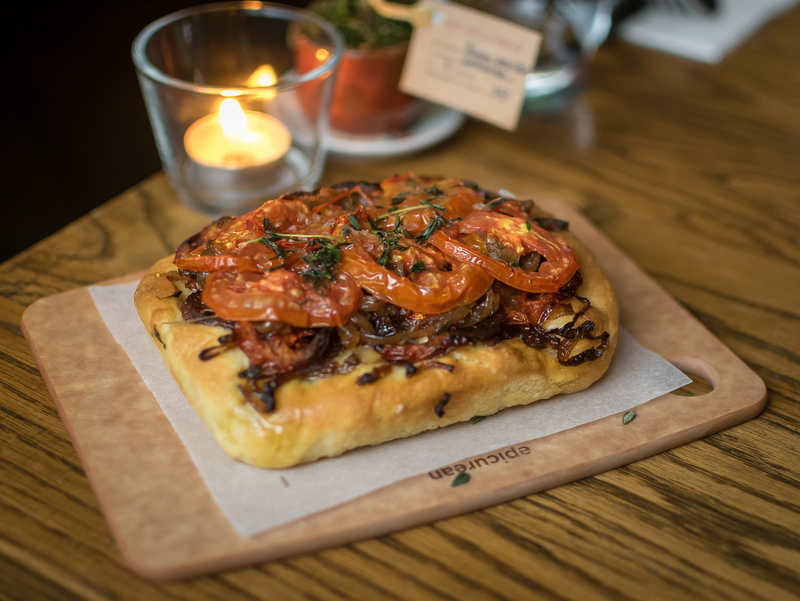 Topped with onions and tomato that have been caramelised till their natural sweetness have been brought out, this is one gluten-free bread I’d be more than happy to eat. 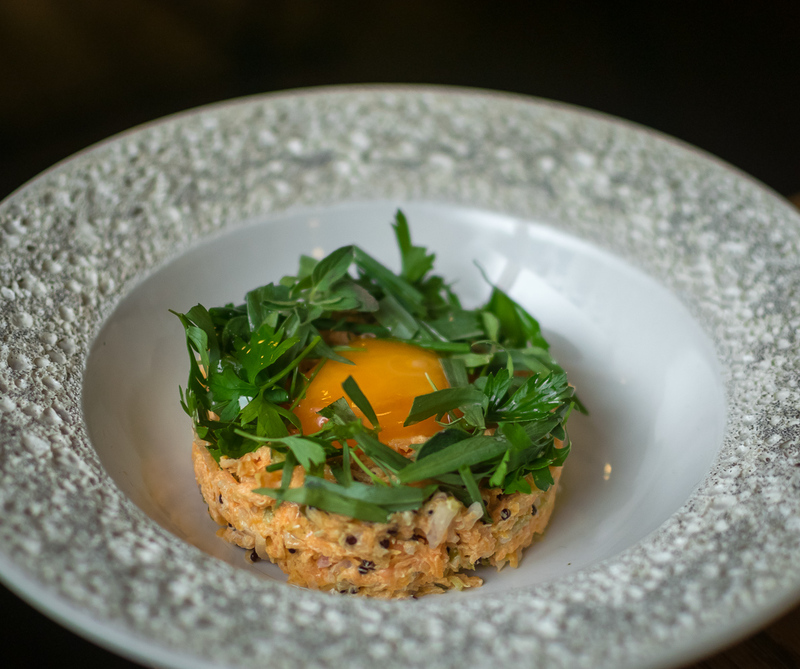 The vegetarian Carrot & Quinoa Tartare ($18) certainly doesn’t lack in bold flavour, brandishing a zesty and creamy ginger mayo mixed throughout the raw crunchiness of shredded carrot, quinoa and red onion. Break apart the cured egg yolk and mix thoroughly for even more depth of taste and texture. 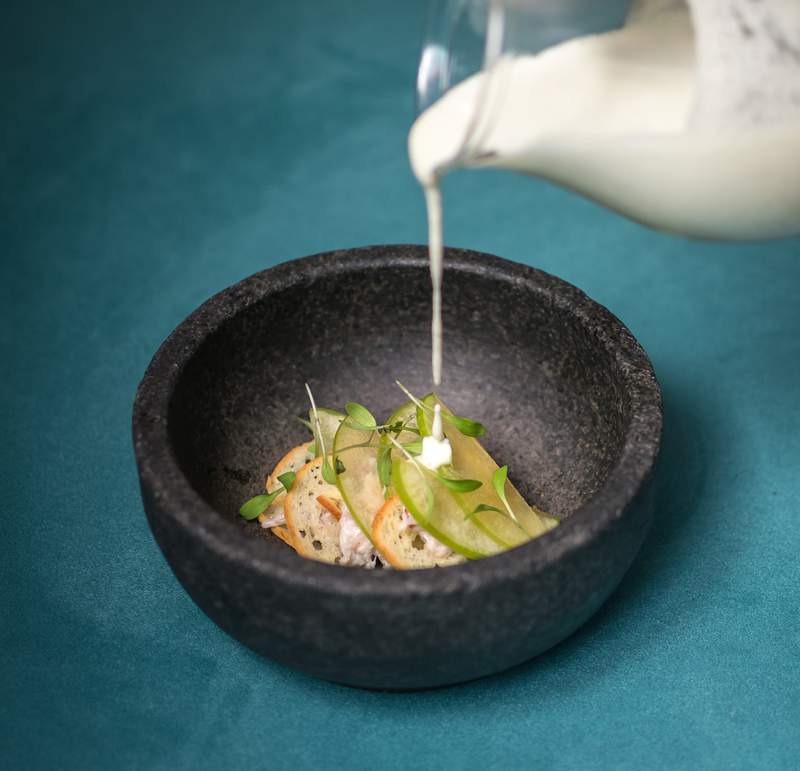 A nice little appetiser of creamy Chilled Almond Soup ($17) poured over crab meat, crunchy Chipá bread(a popular breakfast food and snack in Paraguay and Argentina) and thinly sliced green apple. Certainly refreshing and well made, but not entirely too my taste. Great produce treated simply but with respect leads to great food, as this plate of succulent and sweet Grilled Asparagus ($25) can attest to. So many individual tasty things on the plate that harmonise as a whole such as the mellow banana shallot, creamy and earthy mushroom cream, and a shower of smoked ricotta that practically dissolves in the mouth. 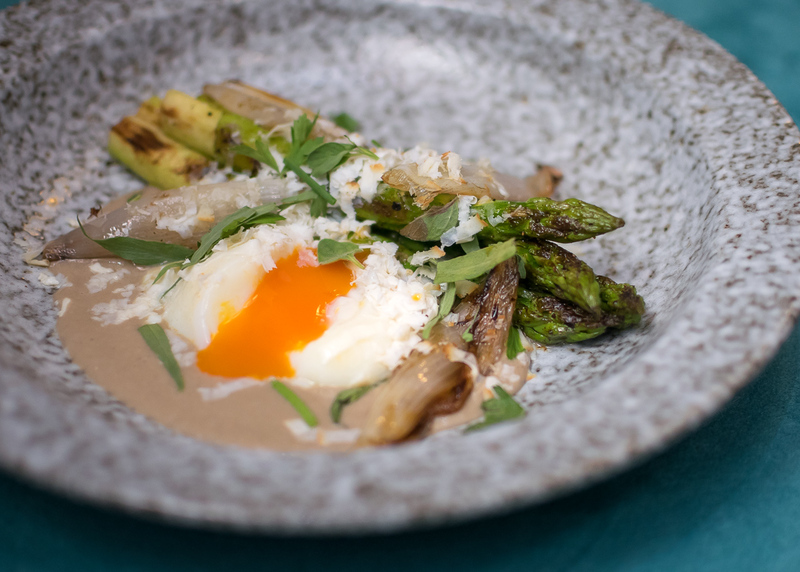 Run each stalk of asparagus through the mushroom cream and that dreamy 63 degree egg for maximum flavour impact. Next level deep-fried kale game absolutely smashing it outta the park. 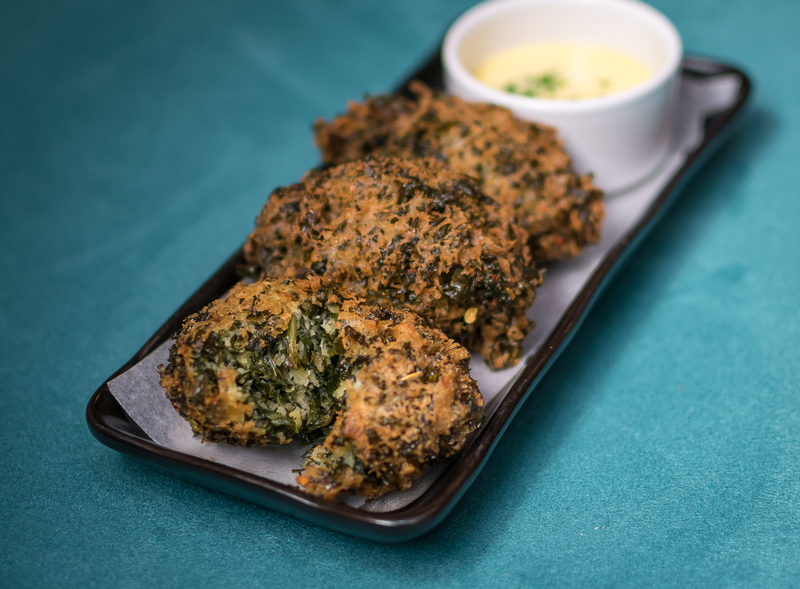 The crisp and brittle exterior of the Kale & Gorgonzola “Bunuelos” ($14) is utterly delightful to crunch through, but what lies beneath is just as good – light-as-air bits of crispy kale permeated with the funky creaminess of gorgonzola. 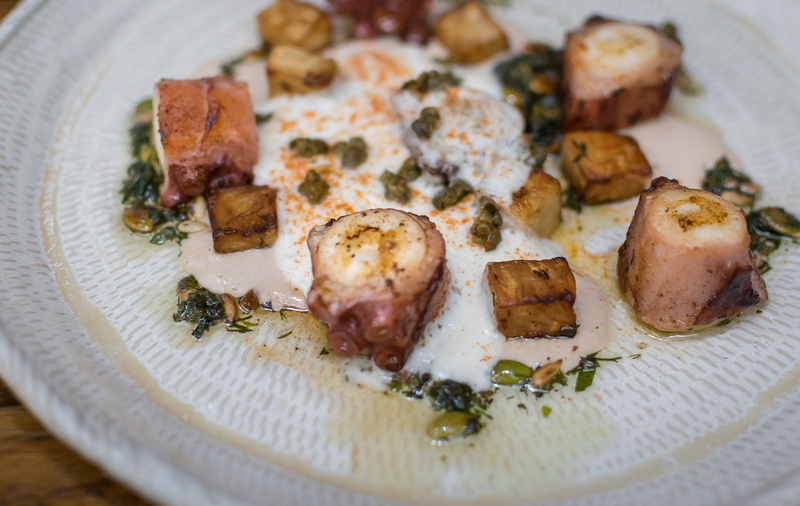 Looking like a marine life murder scene, a whole Grilled Octopus ($28) tentacle is cut up into large chunks and strewn across the plate. Silky smooth celeriac foam and an intriguing tuna mayo provide more than ample umami and are an excellent complement to the smokiness of the meat. Elsewhere, pumpkin seed salsa verde and capers lend the perfect amount of acidity as a foil to the rich sauces. If there was a minor quibble, it would be that the octopus in its current size was quite chewy and could have been cut into smaller, more manageable pieces. Kudos has to go to The Butcher’s Wife for putting so much heart and thought into their gluten-free menu. 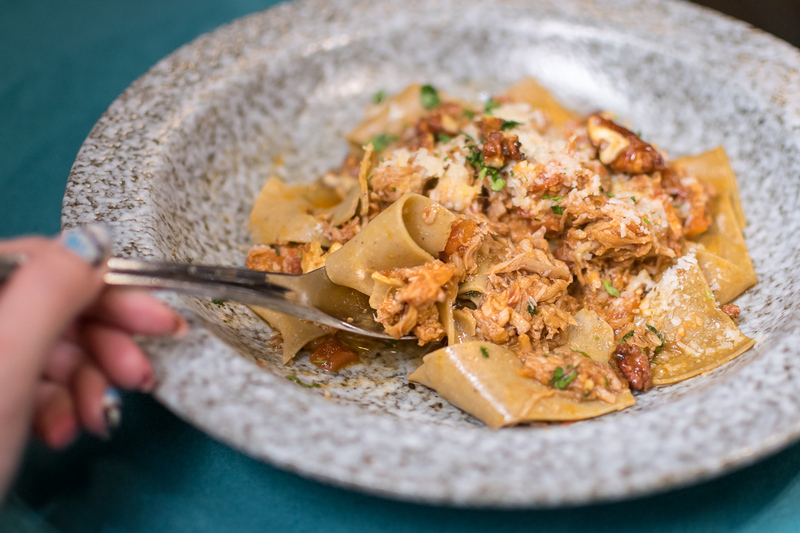 The house-made Chestnuts Papardelle ($25) made from chestnut flour – broad, languid sheets of pasta – are the perfect vehicle for carrying the flavour of the 8 hours braised fork-tender ossobuco, but I’ll be the first to admit that the texture of it was a little too dense. There’s bags of flavour between those two buns, packing a juicy patty smothered in melty provolone cheese, awesome bacon jam and sriracha mayo to satisfy those Beef Burger ($29) cravings. Onto dessert, the sinfully creamy Chocolate Pave ($15) is the devil to the pristine pear sorbet’s angel, and the two go hand in hand. 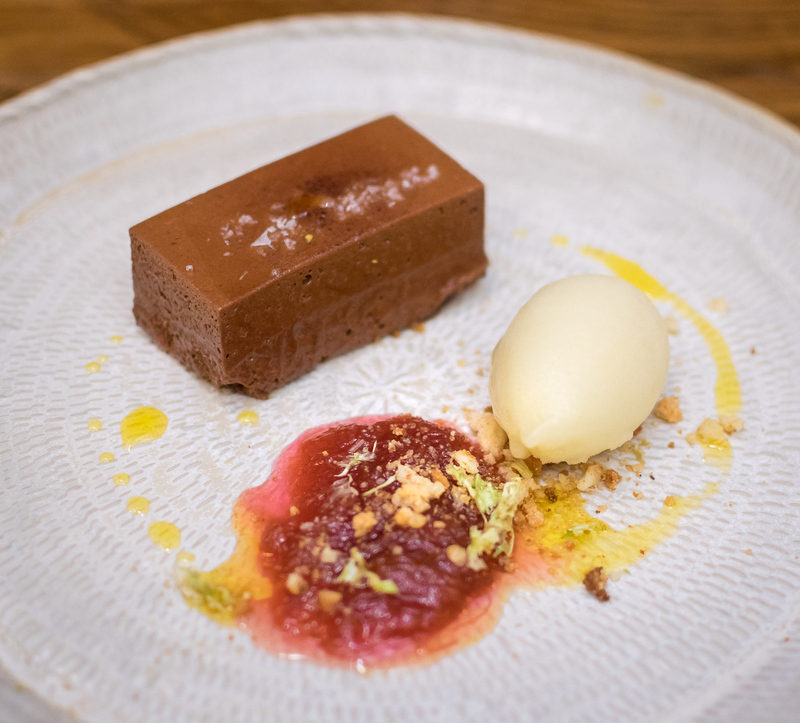 Served with a jammy rhubarb compote, saffron syrup and celeriac crumble, the dessert alternates between rich and refreshing with strong flavours throughout the board. 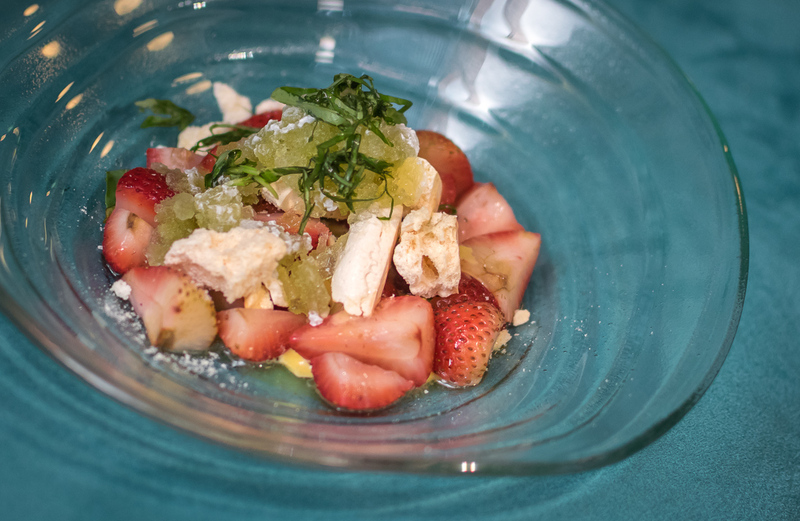 Deconstructed pavlova with meringue crumble, basil granita, passionfruit curd and strawberries is at once simultaneously intensely sweet and refreshing. Whilst the first few mouthfuls cleanse the palate with herbaceous and citrusy notes, subsequent bites of the Strawberries Pavlova ($14) get progressively saccharine. Gluten-free here is not just an afterthought on the menu, and I can see celiacs and gluten intolerant individuals welcoming The Butcher’s Wife as a high quality new entrant to the dining scene that is wholly inclusive of them.